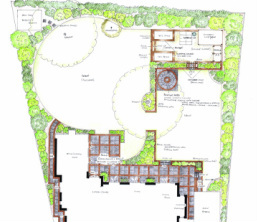 Using her design expertise and extensive plant knowledge, she produces unique, hand-drawn colour plans for all types of garden spaces, from city balconies to suburban gardens and rural retreats. Passionate about plants and the environment, Sue takes pride in providing her clients with gardens they can enjoy for years to come. Using her experience to guide her clients, she enjoys incorporating multiple factors into her designs, whether it be an area for entertaining friends or rejuvenating unwanted garden buildings.